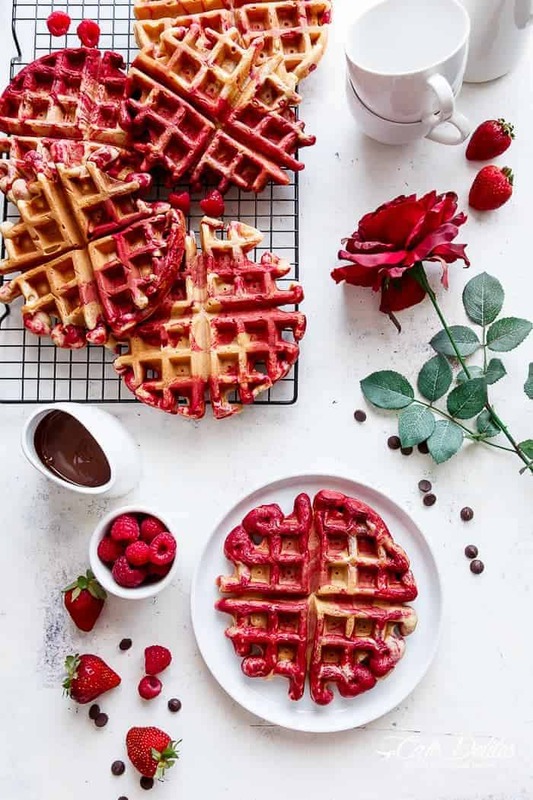 Red Velvet Marble Waffles or Valentine’s Day Waffles made healthier and filling thanks to the addition of Greek Yogurt… Only 186 calories per waffle OR WW 6 Smart Points! Whatever you want to call these and whoever you want to share them with! These are absolutely incredible! 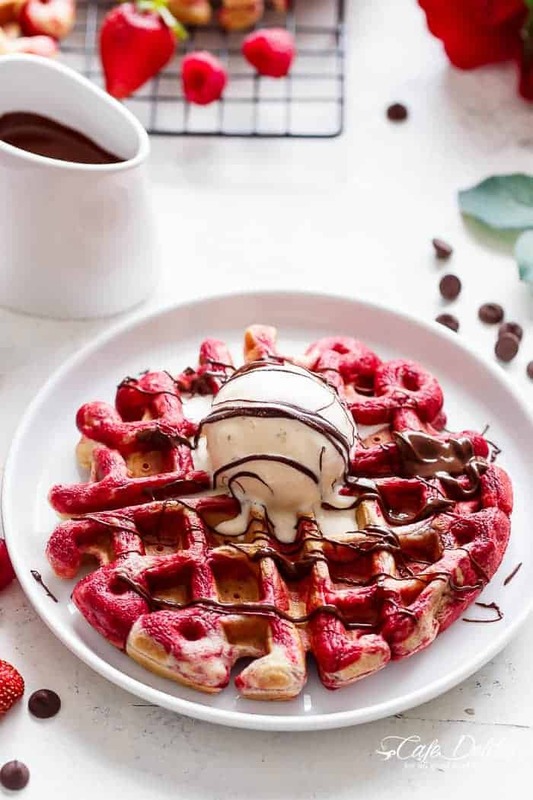 Drizzled in melted chocolate and topped with a scoop of vanilla bean ice cream, these red velvet marble waffles were gone before I could reach for half a waffle. Yep. Valentine’s Day came early over here. I know a few people that are planning out menus and avenues and possible proposals for the ‘big day’…while I’m over here still wrapping my head around saying 2016 instead of 2015. What.just.happened? Easy to make with the choice of two options to make a crazy beautiful marble effect! Option number one is the EASIEST method to beautiful marble waffles and shown in the video below; combining both batters into the one jug. 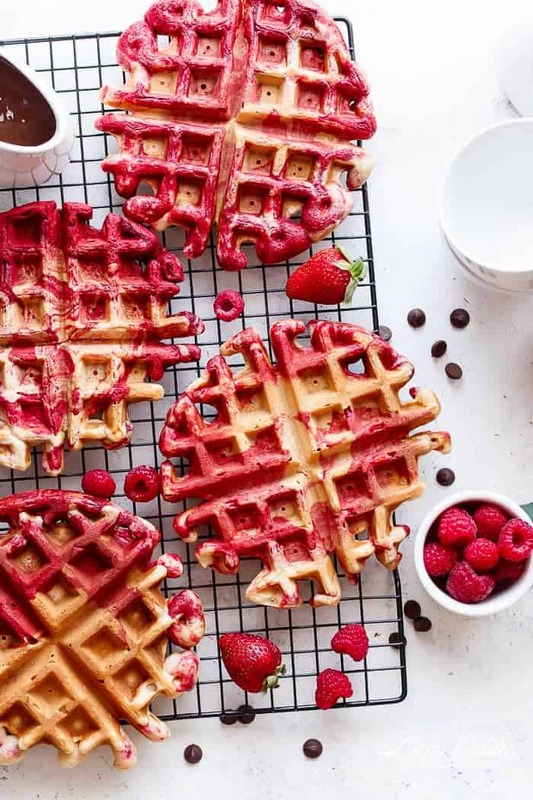 Option number two is drizzling 1/4 cup of the red velvet batter onto your waffle iron first in a zig-zag formation; then top with 1/4 cup of the vanilla batter (or, if your waffle maker requires more batter, simply divide the amount required in half amongst the two batters). Swirl the batter with a plastic spatula (or plastic knife) before closing the lid to cook them! It sounds more complicated than it actually is. I promise. These are better explained in a video…so I made you another one! I decided to show the first option in the video because I found that yielded the best, most beautiful marble effect. I also tried to swirl the batter together in a pouring jug or bowl before cooking, and they ended up PINK! Pink is great if that’s what you’re going for…but my husband prides himself on quality good marble. Aside from the Red Velvet French Toast stuffed with Vanilla Bean Cheesecake or those Strawberries and Cream Crepes with Orange Liqueur I made last Valentine’s Day, I thought these would be a fun way to begin Cupid’s day for those of us with kids. For those of us that share the day with little humans…and little romance. BUT! These did surprise my husband who gifted me with a wink and a kiss upon handing him the plate. So, yeah, not just for families with kids. I left him impressed and speechless. You could either top these with that Creamy Vanilla Bean Cheesecake Topping from those French Toasts I mentioned before OR double dose the red velvet with this Red Velvet Frozen Yogurt instead of plain vanilla ice cream. Either way, it’s a win-win waffle situation! 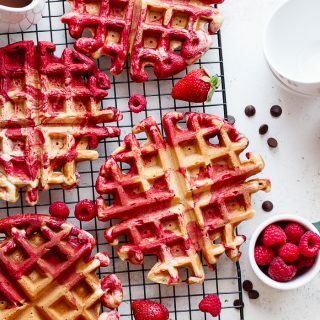 Red Velvet Marbled Waffles made healthier and filling with the extra protein provided by Greek Yogurt! Drizzle in melted chocolate and top with ice cream for extra indulgence! 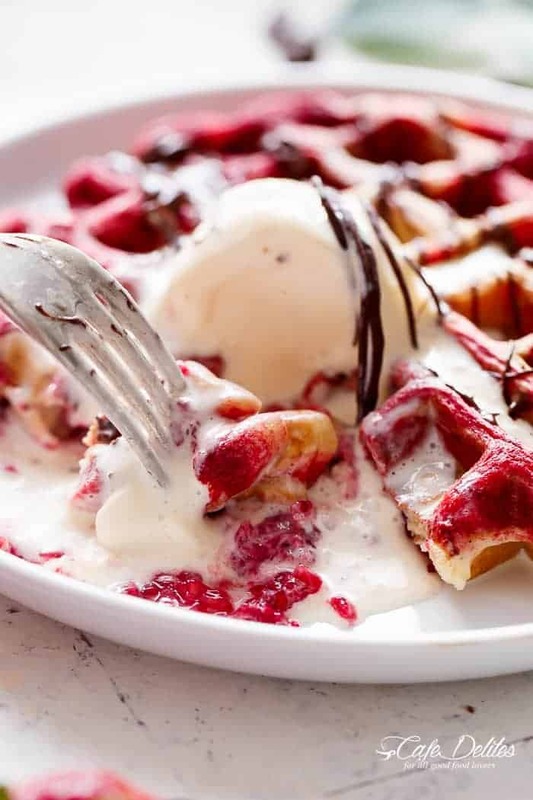 Weight Watchers Smart Points: 6 per waffle! oh my god when i first saw this site i completely fell in love with all the delicious treats my mouth was watering.let me introduce myself my name is heather Elisa and i am 16 years old and i love sweet foods like these i hope some time we can meet in person you are a life saver when it comes to baking. Hey found your recipe for Chocolate Mousse on Pinterest and can’t wait to try it. 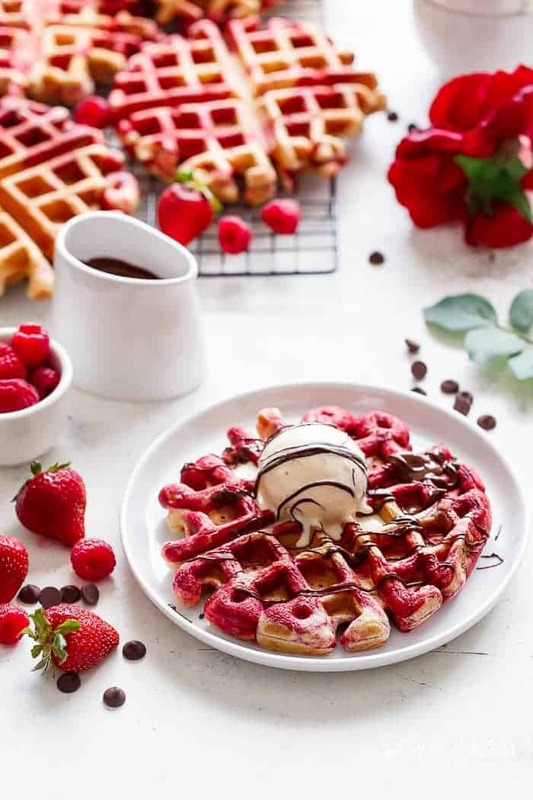 These waffles also look amazing! I do Smart Points and Weight Watchers as well and try to follow low carb. 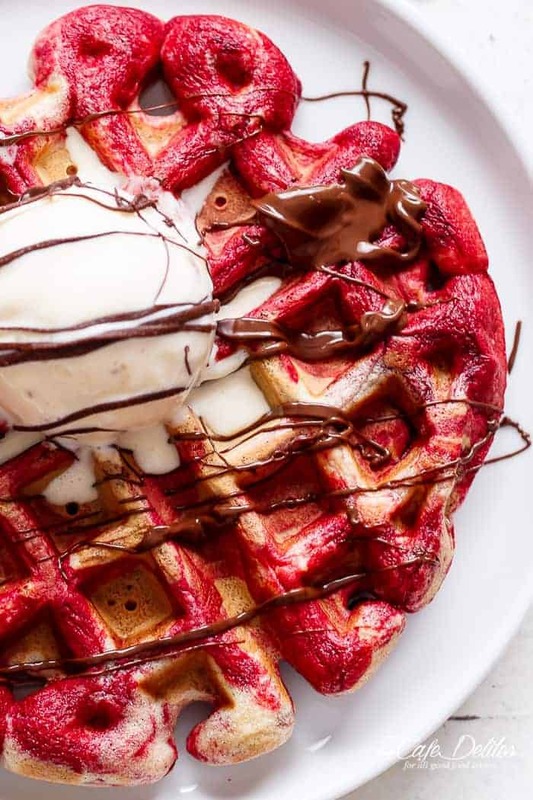 These waffles are totally awesome in every way, shape and form! I love the idea of using beet juice for coloring! What a great kitchen hack!